Joel Kipkemboi Kiptoo hailed the Edinburgh Marathon as the start of a new chapter in his career after winning this year’s event in a course record of 2:13:33. The 32-year-old Kenyan, brought over to the Capital as part of the race’s Project Africa charity, survived an ambush four years ago in his homeland that left two of his training partners dead. He bolted away from the outset at the head of more than 12,000 runners to finish almost eight minutes clear of American competitor Jeffrey Stein with Corstorphine’s Michael Crawley third. Kipkemboi’s compatriot, Caroline Jepchirchir, above, was the leading female in 2:47:36 with local favourite Shona McIntosh 92 seconds behind and Birtley’s Tracy Millmore third. Severino Felipe Gomez narrowly won the adjoining half-marathon from Spanish rival Arturo Quijada Gonzalez in 1:10:37 with Irish Olympian Breege Connolly the leading female in 1:16:09. 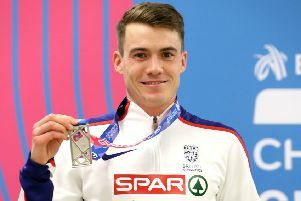 Elsewhere Chris O’Hare secured the British mile title in 4:03 at yesterday’s Vitality Westminster Mile with Edinburgh club-mate Jake Wightman fifth.